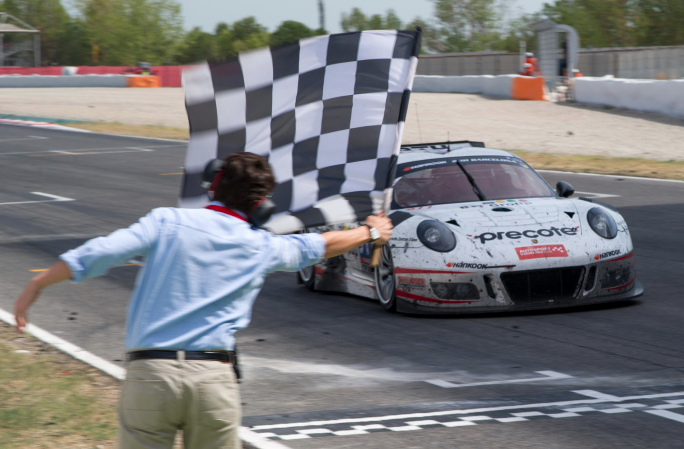 Precote Herberth Motorsport took its third consecutive 24H SERIES powered by Hankook victory at the Circuit de Barcelona – Catalunya. 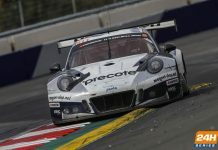 The Porsche 991 GT3 R (#911, Alfred Renauer/Robert Renauer/Daniel Allemann/Ralf Bohn) completed 662 trouble-free laps of the 4.655 km long Spanish circuit to win the Hankook 24H BARCELONA. 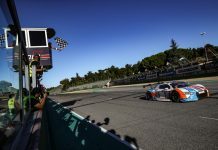 Daniel Allemann drove the Porsche across the line to take the chequered flag, six laps ahead of the Barwell Motorsport Lamborghini Huracán GT3 (#52, Mark Poole/Richard Abra/Jeroen Bleekemolen/Joe Osborne). The Spirit of Race Ferrari 458 Italia GT3 (#53, Alexandre Coigny/Gino Forgione/Iradj Alexander-David/Tom Dyer) won the A6-Am class and finished third overall, 18 laps behind the race winning Porsche. 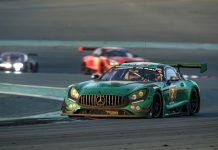 Behind the top three it was the HTP Motorsport GmbH Mercedes AMG GT3 (#41, Wim de Pundert/Brice Bosi/Bernd Schneider/Maximilian Buhk) that claimed the final A6-Pro podium finish in fourth overall. Hofor-Racing Mercedes SLS AMG GT3 (#10, Christiaan Frankenhout/Kenneth Heyer/Roland Eggimann/Chantal Kroll/Michael Kroll) secured another podium finish in A6-Am despite suffering from alternator problems halfway through the race. The Car Collection Motorsport Audi R8 LMS (#33, Horst Felbermayr Jr./Peter Schmidt/Johannes Siegler/G. Tonic/Marc Basseng) completed the A6-Am podium, after getting a post-race penalty. The APO Sport Porsche 991 Cup (#68, Alex Osborne/James May/Paul May) took a surprise victory in the 991 class. After leading from the start the MRS GT-Racing Porsche 991 Cup (#78, Charles Putman/Charles Espenlaub/Joe Foster/Xavier Maassen) hit pulley and drive belt problems in the 22nd hour of the race, which allowed the British squad to move up into first place. APO Sport completed 626 laps, nine laps more than the second placed MRS GT-Racing car. The HRT Performance Porsche 991 Cup (#73, Kim André Hauschild/Artem Soloviev/Stephen Borness/Fabian Engel/Regen Ogrocki) took home third. In the SP2 class Spanish squad Team Icer Brakes were successful on home soil with their Porsche 991 Cup (#82, Jesús Diez Villaroel/José Manuel de los Milagros/Jean-Michel Gerome/Bob Wilwert). A long battle for the top spot with the Porsche Lorient Racing Porsche 991 Cup (#65, Jean-François Demorge/Alain Demorge/Gilles Blasco/Jean-Charles Carminati) eventually ended in favour of the Spanish team. VDS Racing Adventures MARC Focus V8 (#95, Raphaël van der Straten/Thierry de Latre du Bosqueau/Paul Stoffel/Joël Vanloocke/José Close) finished in third place. The Memac Ogilvy Duel Racing SEAT Leon Cup Racer (#1, Ramzi Moutran/Nabil Moutran/Sami Moutran/Phil Quaife) won the TCR class after its main rivals suffered problems. The SEAT that had already won at Dubai and Paul Ricard went on to win at Barcelona as well. Second was the Baporo Motorsport SEAT Leon Cup Racer (#325, Laia Sanz/Jaime Font/Francesc Gutiérrez Agüi/Eric Abidal), ahead of the Team Bleekemolen Seat Leon Cup Racer (#127, Sebastiaan Bleekemolen/Michael Bleekemolen/Melvin de Groot/Rene Steenmetz). Team Altran Peugeot won the A3 class with their Peugeot 208 GTi (#208, Guillaume Roman/Stéphane Ventaja/Kim Holmgaard/Michael Carlsen). It was the car’s fourth win of the season, having already won at Dubai, Silverstone and Zandvoort. Second place went to the Synchro Motorsport Honda Civic Type R (#76, Alyn James/Daniel Wheeler/Martin Byford), ahead of the MDM Motorsport BMW 320D (#118, Mark Bus/Simon Knap/Rob Severs/Bas van de Ven) that had been leading the class for the first nine hours. The SP3 class was won by the JR Motorsport BMW M3 F80 Endurance (#103, Daan Meijer/Pieter van Soelen/Mark van der Aa/Koen Bogaerts). The Dutch team finished 1-2 in class, as the team’s BMW E90 (#102, Martin Lanting/Bob Herber/Patrick van Glabeke/Harry Hilders) finished nine laps behind the winning car. RIMO Honda Civic (#143, Rimantas Blazulionis/Robertas Kupcikas/Martynas Samuitis/Dainius Matijosaitis) scored third place. The Team K-Rejser Peugeot RCZ (#171, Jacob Kristensen/Jan Engelbrecht/Claus Bertelsen/Jens Mølgaard) took home the A2 class win. The second-placed presenza.eu Racing Team Clio Renault Clio Cup IV (#112, Luigi Stanco/Stefan Tanner/Andrew Hollison/Michel Schaap) was unable to challenge its Danish rival after it moved into the lead in the fourth hour. The presenza.eu Racing Team Clio Renault Clio Cup IV (#212, Tim Söderhamn/Niels Nyboe/Christian Rytter/Nicholai Sörensen) went on to take third place. DUWO Racing BMW M235i Racing Cup (#235, Jimmy de Breucker/Mario Timmers/Del Bennett/Fortia Pares/Alvaro Vela) won the CUP1 class.